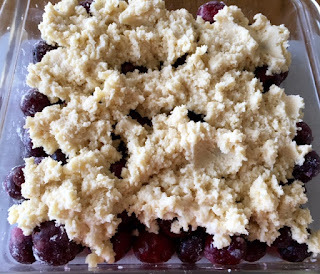 Place the cherries in an 8 by 8 Pyrex pan, ungreased. Mix in the cornstarch and sugar, and squeeze the lemon over the top. Combine the dry ingredients and then cut in the chilled butter, using a pastry cutter. When the lumps are pea-sized, stir in the cream or milk. Do not over mix. 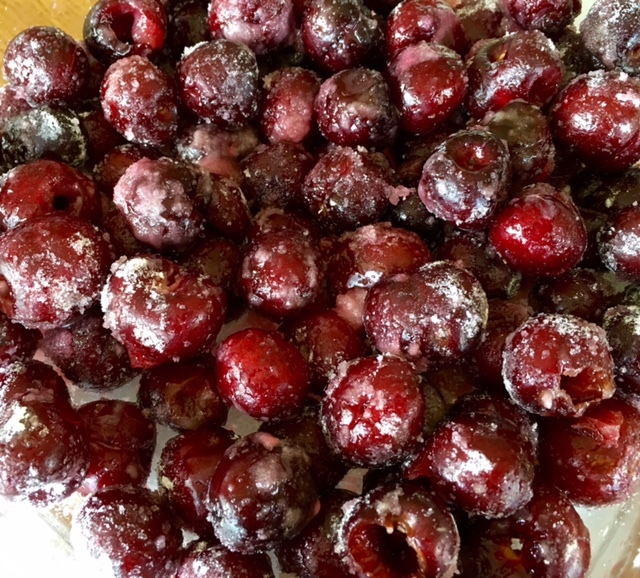 With a large spoon place blobs of the crust over the prepared cherries. Do not worry about smoothing the crust or covering every square inch. Bake at 350 for about 40 minutes. The cherries should be bubbling and the crust a light brown. Let the cobbler cool a bit and serve with almond-scented whipped cream. Who knew our fans were such bards? And these are the four that we starred! And thanks to every single one of you for a terrific day! This cherry cobbler recipe gives me a perfect reason to thaw out the cherries in my freezer. Thanks for sharing it with us. Sounds yummy! Can a pre made crust be substituted for the one in the recipe? I think this has been a great summer for cherries; I couldn't get enough of them. And how exciting to find out that I've won a book from Rhys! I have eaten this cherry cobbler and it is SENSATIONAL! Now to buy a cherry pitter. Oh, the cobbler sounds fantastic! Even with a cherry pitter though...don't know about that much work. So sad to see cherry season end. Congratulations to the limerick winners! That looks so yummy! Cherries are very special… That wonderful combination of sweet and tart. And, hooray! Just let Roberta know your address, and which book you would like! Sisters IN crime -- but you knew that! I'm as giddy as a first-grader at winning Hallie's book! Tough competition! And cherries--I'm a tart-cherry-holic! And cobblers, m-m-m-m! Looks so good! I may have to actually start baking with fruit, though I'm pretty happy with just eating it fresh and plain. A six-at-a-time pitter sounds quite efficient. I've seen the one at a time versions, but never multiples. Good to give warning of strays, and slowing down and savoring is good, too. Deborah Romano--I'd suggest something more biscuit-like, not pie crust. Otherwise you have a cherry pie. FChurch, you're my kind of gal, with the tart cherries! My oldest daughter lives in Michigan, and they have a second home north of Traverse City, the Cherry Capitol of the World, where they have an annual Cherry Festival, around July 4th, I think. 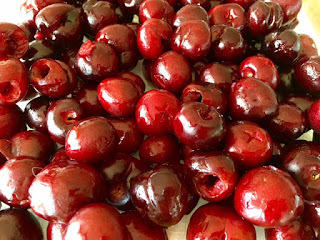 They have had terrible weather up there this year, and the cherry crop is not so great from the extreme drought, but usually we try to get up there in time for the tart cherries. If you ever have a chance to make a pie, cobbler, jams, or pastry from the tart cherries, that is the gold standard. You don't need to add lemon juice for the contrast; they have that part inherently, and the best pies ever are made with them. They have spoiled me forever! Thanks for the advice. I can almost taste it now! I love cherry pie. And I even have a cherry pitter! But I think cherries are gone for the season. ..
Ok Karen, now I'm lusting for the Michigan cherries! Cherries...yum. 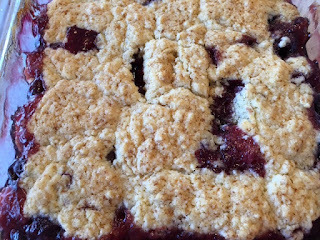 I think the Michigan cherries are gone, but sometimes we get a second round of cherries from Washington or Canada...not quite as good, but still would make a great cobbler. If I ever get the garden I want to have, there will be a tart cherry tree in it! Then you'll have us all over for cobbler? Oh, I love cherry cobbler, and this one has my mouth watering! I have never fixed a cobbler myself, but one of our local restaurants has one to die for. My daughter and her family love fresh cherries, and so I recently gifted her with one the cherry pitters exactly like the Amazon one. I expect to be rewarded someday with a cherry cobbler. You're a smart woman Kathy!